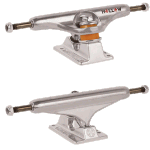 Hollow Skate trucks are made using standard contruction materials, steel axles with aluminum hangers and baseplates. 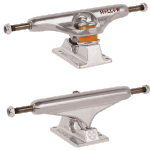 'Hollow' is refering to the King pin and / or Axle being hollow. Having hollow steel components gives your board a lighter feel, that will pop higher and flip quicker.